Our eight pigs seem to be very happy. We move them to a new paddock every week to 10 days and they are eating increasing amounts of grass, weeds and leaves. They also love rooting in the now moist soil for roots, tubers and other goodies which include nuts buried last fall and, probably, grubs and worms. In the past few weeks we have added fallen apples to their diet – sometimes upwards of 100 pounds a day! – and they show their appreciation by loud and enthusiastic crunching and lip smacking. The apples are free food, courtesy of neighbours and other people in the County with trees which rain apples down onto the ground. These people are happy to have us clean up their grass, the pigs are delighted and we are looking forward to us and our customers enjoying extra specially flavoured pork in less than one month. Of course the pigs almost always want more food, especially food that comes to them already prepared and served to them in their trough and which saves them the work of having to go out and get it themselves by grazing or rooting. Like many of us, they don’t like working too hard for their food and when they see me coming with their next ready-made “restaurant” meal of whey, corn and cheese, they get very excited, demonstrated by their loud clamoring, jockeying for best position and ear-biting when they get pushed aside. They really enjoy eating but seem to be most contented when they are taking a bath. Usually it is a mud bath that we make for them by pouring some water in a low spot with some bare soil. 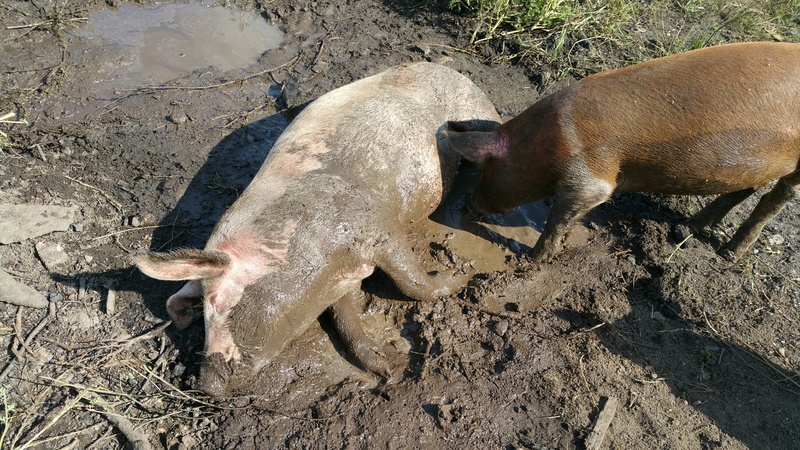 If they don’t like our chosen mud bath they sometimes take matters in their own ‘hands’ and create their own mud bath by tipping their water bucket over and rolling around in the resulting puddle. I suspect that they think it is fun to see me hauling more water to refill their water bucket, especially on the really hot afternoons. Either way, whether it is in a mud bath which we created or one they made, they are often a picture of contentment as they lay in the mud in order to cool down during this unusually hot summer. I really wish that technical problems weren’t preventing me from posting the video of this scene. You would then hear the contented grunts to go along with the look of bliss on the pig’s face. 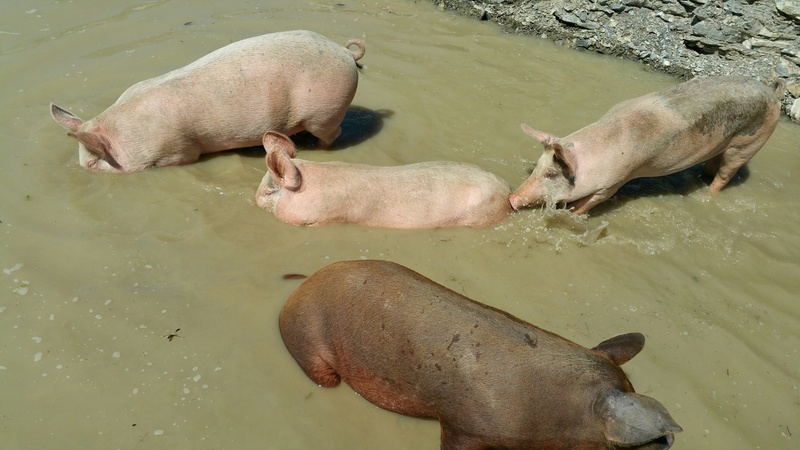 A few days ago, we moved the pigs into a new paddock near the house, one which has not just a mud bath, but a whole wading pool! We decided to include the “duck pond” which lies between the house and road in this paddock and see how they liked having water always available to them. The water is not very deep because our subsoil is still dry but the recent rains did put about six inches of water in the bottom of it. Not only were we thinking that the pigs might like the water but we wanted them to do some work for us. The pond emptied rather quickly in May once the weather had been dry for a few weeks and we have heard that pigs can help seal ponds by packing tight any mud in the bottom with their pointed little feet and also by adding some sticky “mud” of their own making to the bottom. 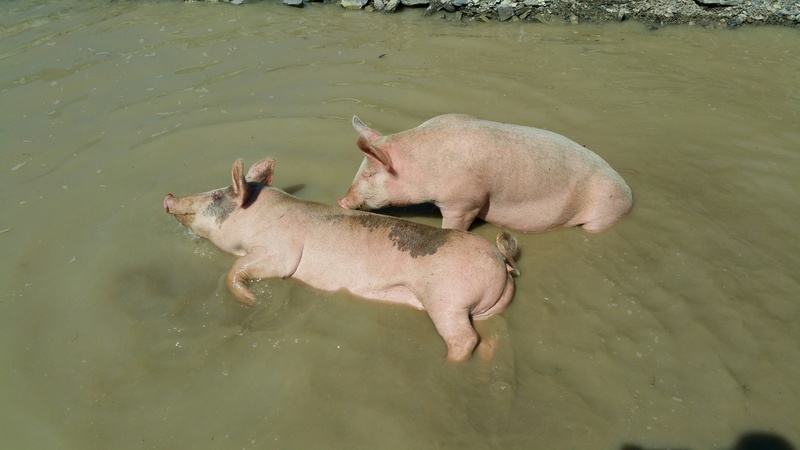 Thus far, the pigs seem to have given an enthusiastic “thumbs up” to their new bath. They enjoy their new pool so much that they haven’t tipped their water bucket over once in the past few days. We will probably have to wait until next summer to see if their time in the pool has helped seal the pond. 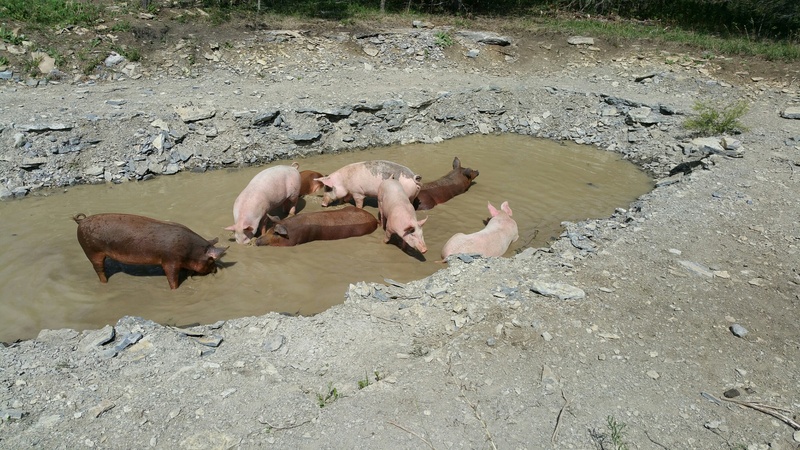 All eight pigs are often lounging together in their new pool. The water is extra muddy because I added some soil with clay in it for them to trample into the rocky bottom. Blowing bubbles and, probably, drinking the muddy water. …. and just plain relaxing in the cool water! They look like they are in Pig Heaven!! Looks like the pond is big enough for everyone: no hogging needed! Thank you both for giving us the pleasure of sharing the pleasure of watching the antics of your happy piglets.